Want to Keep Your Cat Close to Your Heart? 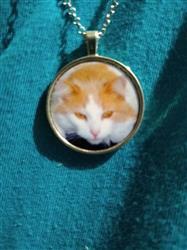 New Personalized Custom Made Necklace and Pendant with a photo of YOUR cat! Treat yourself, or buy it as the perfect gift for any passionate cat owner. After placing your order, reply to our order confirmation email and attach the photo you would like to use. A photo taken on any late model smart phone is usually fine, the higher quality photo the better. If there is any problem with the quality or composition of your photo, we will contact you to resolve it before creating it. Customizable Pendant Necklace with Your Cat has a rating of 5 stars based on 2 reviews. A little larger than what I thought it would be. You guys are great! My daughter loved her pendant with her dog picture on it. Great service.